Curses! 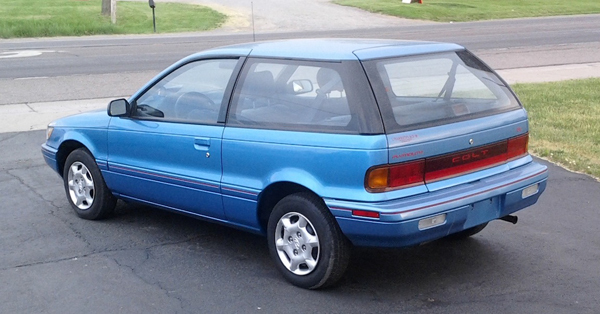 that I didn’t come across this 1992 Plymouth Colt GL hatchback before recently purchasing my latest ride. It’s sitting in an Albion lot (as well as being listed on Rochester’s craigslist) with an asking price of just $2,600. The CL listing says it’s a one-owner vehicle with only 35k miles and working a/c. These Colts were actually badge-engineered Mitsubishi Mirages sold at Dodge and Plymouth dealers as a stop-gap until the Shadow/Sundance sub-compacts came to market. Jim Corbran, RRofWNY Check out our new Facebook page: LuvTheCheapies The post RealRides of WNY appeared first on Buffalo Cars.